The 5-masted barquentine Forest Dream was one of three wooden sailing ships built in Aberdeen, Washington by Grays Harbour Motor Ship Corporation in 1919. The other ships in this trio were Forest Pride and Forest Friend. They had been intended as motor ships and were part of a large fleet of wooden vessels built when the United States entered the First World War in 1917. At the armistice, dozens of these ships were still under construction and as the demand for ships had fallen, they were not fitted with engines but turned into sailing ships. Between the years 1910 and 1920, 170 large 4, 5 and 6-masted schooners and barquentines were launched from North American shipyards. Their main employment was carrying timber to Australia and South Africa. Whilst Australia had large resources of hardwoods, the softwood, Douglas Fir, they brought, was an ideal building timber. They then loaded coal at Newcastle in New South Wales for South America or Hawaii. This coal fuelled the Chilean railways and the Hawaiian sugar mills. As timber is a light cargo they carried a large proportion on deck. Temporary wooden rails were constructed on top of the timber cargo. Captain A.F. Renaud of Seattle told me of his time at sea in sail, saying that he joined Forest Dream in Newcastle, NSW, as first mate in 1922. 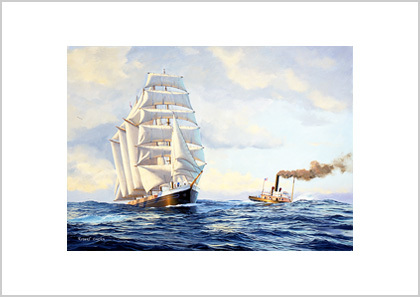 He said that his voyage in Forest Dream was the most enjoyable he had ever experienced, having previously sailed in the four masted barque Edward Sewell and barquentine Russell Haviside from 1914. He said the master, Captain Wester was a capable seaman and easy to get on with. The quarters were large; the food good and there was even a generator for electric light. There was a Donkey boiler that powered winches at the base of each mast to hoist the heavy gaffs. Another seaman Milford Loraway who sailed in a similar barquentine Oregon Pine, told me that the Pacific run with was ideal for these large schooners and barquentines, with their huge gaff rigged sails. The NE and then the SE Trade winds on the beam allowed the ship to sail for days on end without having to trim the sheets, and it was almost possible to lash the wheel and let the ship sail herself. They had a hard bilge and with no cargo could almost sail without ballast. They were not as handy as a square rigger down wind as it was difficult to keep the fore and aft sails filling and in the doldrums the rolling of the ship caused the heavy gaffs, with no wind in the sails, to slat about, causing much wear and stress on the stays and masts and sails. Forest Dream was burned at Stromstad, Sweden in 1933. The 5-masted barquentine Forest Dream was one of three wooden sailing ships built in Aberdeen, Washington by Grays Harbour Motor Ship Corporation in 1919. The other ships in this trio were Forest Pride and Forest Friend. They had been intended as motor ships and were part of a large fleet of wooden vessels built when the United States entered the First World War in 1917. At the armistice, dozens of these ships were still under construction and as the demand for ships had fallen, they were not fitted with engines but turned into sailing ships. 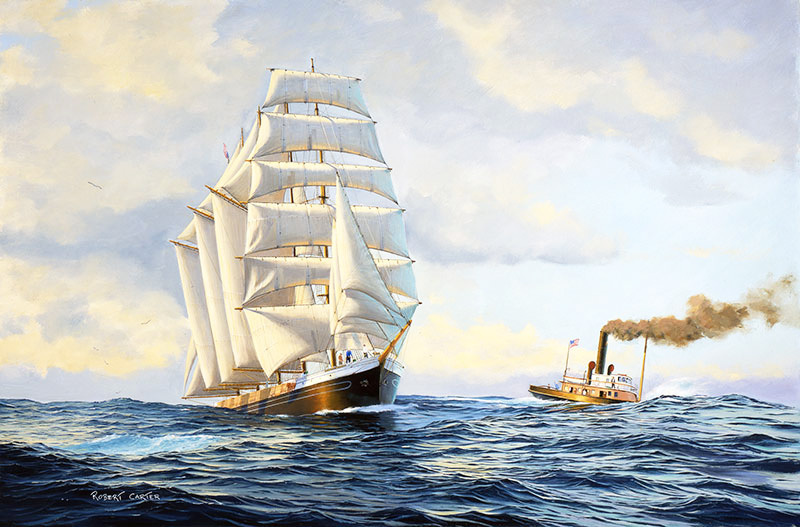 Between the years 1910 and 1920, 170 large 4, 5 and 6-masted schooners and barquentines were launched from North American shipyards.